USB Safeguard is a portable software program to encrypt and protect data with a password on your removable pen drives using the AES 256 bits encryption. The main purpose of using a USB pen drive is that you can bring your data with you wherever you go. But if you lose your USB pen drive your data also lose. This is dangerous if you have confidential files stored in it. Protect the pen drive with a password! ...... data stored on USB pen drives. Also, USB Safeguard has a useful feature that allows you to enter your email or phone if you lose the pen drive. 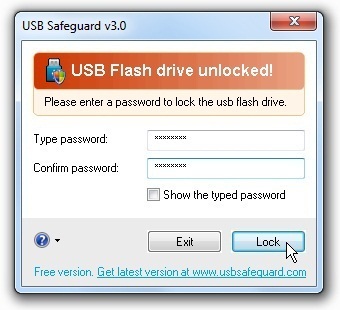 USB Safeguard free version works only with USB Flash drive of size max 2 GB! USB Safeguard offers users (novice and expert) a friendly yet extremely powerful security solution that fully protects valuable data stored on USB pen drive. Prevent virus spreading through usb removable drives. Qweas is providing links to USB Safeguard 3.1 as a courtesy, and makes no representations regarding USB Safeguard or any other applications or any information related thereto. Any questions, complaints or claims regarding this application USB Safeguard 3.1 must be directed to the appropriate software vendor. You may click the publisher link of USB Safeguard on the top of this page to get more details about the vendor.